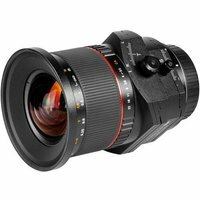 The Samyang T-S 24mm f3.5 ED AS UMS is a wide-angle, tilt and shift lens with perspective control and tilt-shift functions of the focal plane angle within the range from -8,5 to +8,5 and parallel shift of the optical axis by ±12 mm. The sections responsible for the tilt & shift function may be rotated against each other by 30, 60 or 90 degrees and the bayonet mount can be independently rotated to the right by 90 degrees at 30 degree steps. The Samyang T-S 24mm model uses 16 lens elements divided into 11 groups. This includes two aspherical lens elements (ASP) preventing the spherical aberration effect and two lens elements with a low dispersion factor (ED), that reduce the chromatic aberration effect to the minimum. Each lens element is covered with multilayered anti-reflective UMC coatings to ensure perfect light transmission, high contrast and accurate reproduction of colours.